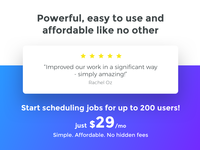 We keep it simple and affordable - Starts at 29$/month for up to 200 users! 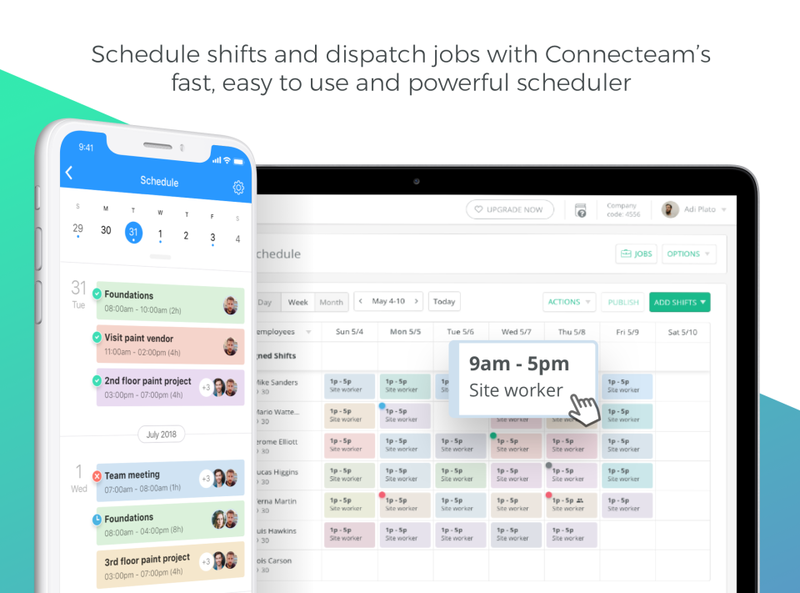 Schedule jobs and track time with Connecteam's all-in-one app that's both powerful and easy to use, designed and built especially for non-desk employees. Scheduling includes advanced capabilities like dispatch with drag & drop, private or team shifts, upload shifts via excel and much more to make your scheduling experience fast, easy and productive. Also, enjoy the only true shift collaboration with GPS status updates, notes and integrated chat. 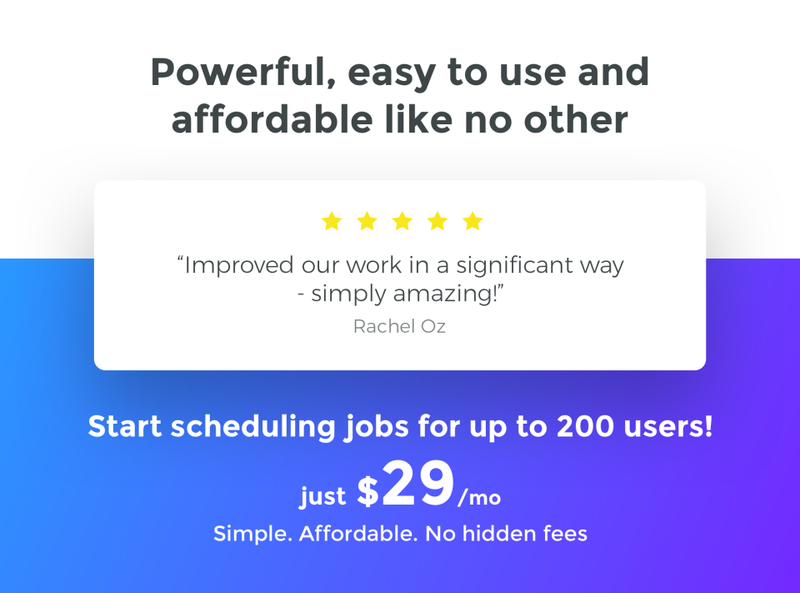 Starts at just 29$/month for up to 200 users! Pros: Want to design your own employee app? No, seriously... a REAL app? Connecteam is for you. Want to add custom features such as a mobile time clock, work schedule, event calendar, incident report app, reimbursement report app, online education center, custom push notifications, digital company handbook, in app messenger, team self-assessment, team surveys, a mobile help desk, and much much more? Connecteam is for you. It is ready to right after sign up, and scaling up seems endless. I could rave for days - l.i.t.e.r.a.l. days about everything I love about this software - but I don't have the space. What I will say is that Connecteam has solved every problem I've had since starting my business that I paid over 2x as much for other programs to do that couldn't. Connecteam is what all other 'create your own app in a few clicks' companies wanted to be and promised to be. Cons: I only have 2 dislikes - that's right... out of all the amazing features and functionality available in Connecteam, I only dislike 2 things about the software. Just pause a moment before I proceed and let that sink in. Cons: The 1st con actually isn't a software issue. It's a support issue. Support is readily available, super polite, and extremely responsible. However, for elevated tasks, a ticket must always be created and escalated and the wait times for that are extremely, extremely long. Need help setting up a feature? Connecteam support is there almost instantly willing and ready to help. Need help figuring out why said feature is doing something wonky? Sorry, gotta create a ticket for that. Right now, I'm still waiting on a resolution for a bug I reported over a week and a half ago. Thankfully, the bug doesn't restrict my ability to use the software. It's more of a cosmetic issue. The 2nd con is that there is a feature in the software called 'Workflows'. In brief, it allows you to set up an app within the app of sorts where app users can enter info or submit forms, and someone else (such as a manager or payroll approver) can review what was submitted and update the status (to something such as approved or rejected, for example). The problem I have is that there is no way to leave a note to the submitter after reviewing the submission. You can't leave feedback or praise, you have to start a chat to message someone which means backing out, extra clicks, etc. Overall: Overall, I am BEYOND satisfied with Connecteam. Despite the very long wait times for escalated support, the software is well-built and so far works as it should, so escalated support isn't something one would need often anyway. It is feature rich, and very affordable. Worth every penny, and I am so happy that I stumbled across this. As for the Workflows - I agree! Stay tuned for amazing new capabilities coming to the Workflows in the next few weeks. The notes support for mobile and much more is coming your way. We always revision features according to customers' feedback and this has come up a lot, that's why it's in our roadmap for Q1 of 2019! Thanks again for putting the time, it's golden to us! Pros: I have several old-school folks on my team. I tend to get a lot of push back when I introduce a new form of technology. We don't have a central meeting location therefore I can't have one time clock for everyone to punch. This app works great and my team really seems to like to like it. It is very easy to install and user friendly. Cons: Connecteam is a newer innovative company. Due to that, I believe they are still making quite a few changes to their software (mostly really good changes, but changes none-the-less). I don't have an abundance of time to look at the desktop launch pad and check out all of the new features. The support staff is always willing to help you out when you need the assist though. Overall: My overall experience is great. Well worth the money! We are introducing improvements and new capabilities on a weekly basis, so there's always something to look forward to! We will soon introduce a new managers tab in the app that will allow us, among many other great features, to highlight software updates and improvements for you when you're on the go so you won't miss out and have an easier on boarding experience for big releases. Pros: Connecteam is among one of the many communication platform that are being in our organization. We mostly use this tool in internal communication between the employees. 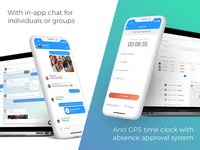 One of the merit about this tool is that it has numerous features that allow us get connected such as the group chat and the instant employees surveys. Connecteam has one of the best customer support team that i have come across. The support is always available and up go even an extra mile to make sure that your problem is well solved and that you are fully satisfied. The solution is highly customizable and flexible . This allows one design it in the manner that will fully meetyour day to day needs. Cons: The UI of the tool looks old although it is functional. Overall: Connecteam has improved communication internally and improved on workflow. It is a tool that is of high quality and i would highly recommend it. Pros: Connecteam is a sofware that is being used departmentally in the institution.It makes it possible for members of each department to internally communicate. 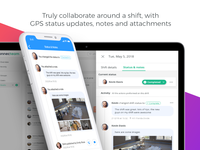 It has different options in which employees can use to be kept up to date and feel connected. One of the thing that excites me the most is the great customer support that is always reachable. The software is also easy to use and come at a market friendly price. Cons: Hardly can i mention any dislike. It is a great product and i love it. Overall: It is a user friendly tool that has made communication within the department of the institution easy. Pros: Connecteam is a software that is being used departmentally in the organization. It allows for members of veach department to internally communicate. What I like most about the software is that it is easy to use and also the customer support is always available. It has helped us to communicate with speed and at ease. Cons: I am beyond satisfied with the sofware. It is reach in features and very affordable. I have no dislike for the product. Overall: It is a sofware that is easy to use and has enabled us to communicate with speed and at ease. Its rich in featuresand worthy every penny. Great platform to reach all employees. Pros: Able to deploy messages to employees with no organizational mailbox. Arrange registrations to events and meetings. Get feedback surveys for trainings in the company. Great support team (especially Chen Shofar). Cons: It would be great to be able to grant specific permissions to a manager in the organization to check out reports submitted by his employees. It would be very interactive to be able to reply back to a specific report submitted by employee - for example, if an employee report for safety incident, we would like to tell him/her that his report has been handled. Pros: Connecteam is currently being used across the whole institution as one of our most preferred communication platform. With the tool we feel connected since there is real time communication across department. The software is also easy to use and less expensive. Cons: Hardly can i mention a dislike if the software . It worth every penny and i love it. Overall: It is a tool that has made us get and stay connected. It highly reliable and highly functional. Pros: We like the GPS location reporting of where our team members are clocking in from. Being in the construction field, our job-sites change on a daily basis. Great value for the savings we received from either accidental or intentional time punches. Cons: For our needs, there are no complaints. The reporting provided useful information, the edits were easy and the overall experience was seamless. Beyond expectations for an app ! Overall: Connecteam app has improved our compliance and implementation. Streamlined communication. Helped reduced operating costs. The managers are constantly improving the checklists ,surveys and more.. we have 6 branches across the country and connecteam is a vital part of us and for us. Pros: The eye candy launch pad is amazing and the mobile application is very much uncomplicated, with simple yet effective home menus and easy to use. The intuitive and smart way the launch pad was built not only is giving me many ways to communicate productively with my team, but is also affecting positively our revenue, as we are on top of everything in real time. I am also spending less time on my desk and more on the operation. Cons: It could offer more languages, as I do have team members that do not speak English. The time clock in my case is isn't the most appropriate tool, but for now I don't know how it could became better. Some of our local partners are hard at work creating localized versions (read - various languages). Easy to track my off site employees! Pros: It's easy to use and has a lot of features that may become more useful in the future. Cons: It loads a little slow and you can't clock in and out if you're in a rural area with little to no cell service which happens to us a lot. Overall: We have been searching for a free time clock that our team could use remotely as we aren't all in the office when we clock in or out. This has been the perfect solution. even during the first few weeks when people were getting used to clocking in and out it was easy to correct their times when they'd forget. Its been a perfect solution for our small business to track times more accurately which has saved us money because people are no longer "guessing" what time they clocked in and out. The staff really likes teh new feature of being able to see their time sheet, too! We just added the time sheet on mobile feature and the team is very happy to hear you guys like it. Pros: its very flexibel and i can customize how i need it. Thanks Tayfun for this awesome review!! We love having you onboard! The admin tab for your app is coming sooner than you imagine :) Stay tuned!! Internal communication, employees training, surveys, employees feedback etc. Pros: it's all about the great user experience and usability! when your employees embrace new technology so fast it makes our internal communication much more efficient. Cons: We're waiting for one feature that important for us but it will be published in the next two weeks so that's ok.
Pros: I had tried different types of servies like connecteam. No one in my opinion can compares to connecteam in terms of overview, "easy to use", great tutorials and the best live-chat community with so friendly and caring sales people. Cons: Haven't discovered anything yet. Every time I find something they have an answer or solution for it. Overall: We have a business with alot of sales people on the road. This is a way to enhance the community with them, and ease the way we deliver information and gather informations. The perfect tool if you have salespeople. Thanks to your amazing feedback we're able to continue and improve Connecteam. We have amazing plans down the road which we're sure you'll love! Thanks again! Pros: Easy, simple, quick to manage everything, easy navigation, everything is customizable, and it just works. Cons: There are still missing features, but after each update, the product gets closer and closer to fix all my problems. Overall: Simple and easy to use is my experience with ConnecTeam, software that fits my business like a glove. 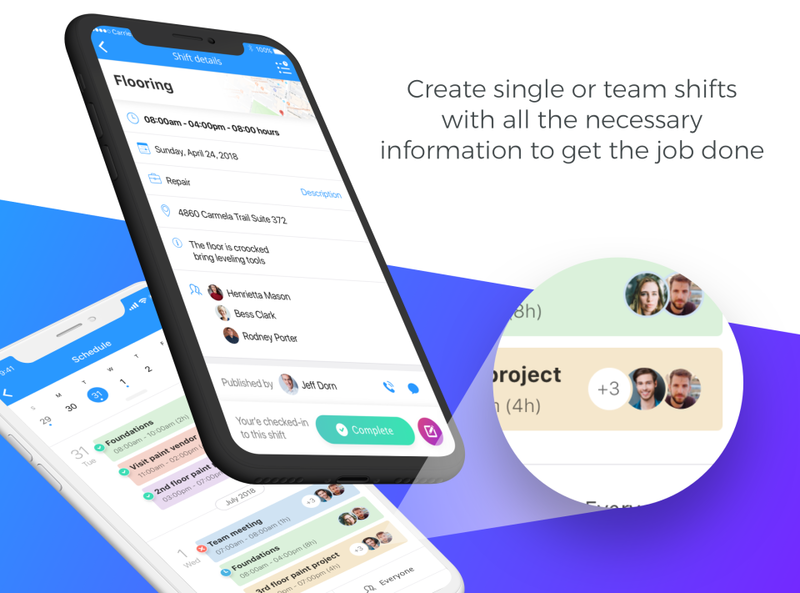 The ability to create custom and even complex checklist and workflow is why ConnecTeam is my go-to tool for everything related to my employees. What I have seen is strong focus on making my life simple. Keep up the good work. Recommendations to other buyers: Yes, please try it out, you will be surprised and happy with our choose. You can't see from where you're sitting but we're blushing over here. Totally blown away! Reviews like yours make us want to keep doing better. Very easy to implement, great support for start up businesses! Pros: Love the functions, ease of use, and customer support. Cons: Moving content between functions is not possible yet. Overall: Awesome support and quick response! We keep on improving Connecteam all the time, and hopefully that "moving objects" capabilities will be enhanced sooner than later :) We'll keep you posted! Pros: Great user experience so far. The features/assests are easy to customize and support team is readily available and answered my question quickly. Cons: Would like to see a "Knowledge Sharing" forum for users to communicated with each other and display examples on how they are using the Connecteam tool for thier business. We love receiving feedback! Thank you for the kind words! You'll be happy to hear that we actually work on something interesting for our customers - a place where they can share use cases, ask each other questions and receive product updates before it's being released. We'll keep you posted! Pros: The software is very practical, and easy to use. The customer/ tech service is phenomenal. Very helpful and responsive. Cons: I do not have any negative critiques of this product at this time. Overall: Overall, I am extremely satisfied with the ease of the software, and highly impressed with the responsiveness of the customer service team. We keep on improving Connecteam on a regular basis and highly valuate and consider customers suggestions when developing the product. I love how easy it is for employees to clock in and out on their cellphones! Pros: I love how the software includes GPS coordinates so I can be sure that employees are clocking in and out from the office. Overall: Part time employees can clock in and out with ease and it is less stress for the managers to keep track of their hours. We're always trying to make Connecteam as lean as possible. If they haven't tried downloading in a while then they should try again as the app is leaner now. Pros: Ease of usability to provide drivers with all required information in a timely manner. Cuts down calls into the dispatch customer support is second to none. Cons: Not yet any issues have been dealt with quickly and efficiently. Overall: From initial startup to becoming familiar with the program the support has been second to none. It is very user-friendly and has improved our ability to respond in a timely manner as well as decreased the number of phone calls into dispatch operations allowing them to concentrate on customers and in turn increase orders. Pros: It is easy to communicate and use! Everyone on the app loves it! Cons: Nothing everything is great! The team provides great feedback! Thanks for the great review. We're always happy to hear that we could support positive change in any kind of organization. Keep up the great work. Improved our work in a significant way - just amaizing! Comments: First of all I would like to point out my work with Astar Kariv. She is amazing to work with and I can tell she is service oriented. The app helped us improve our work and as made our projects more efficient. Since we started working with the app the communication in our organization as progressed and the information is arriving faster and more accurate to our workers. The app as a variety of options which allows us to use it for many projects and easements. The service level is very high which give us the options to come to connecteam stuff with any questions and easements. Pros: The app & the portal are so easy to use! It has made managing employee accountability & payroll in several different states easier than ever. My favorite part of ConnecTeam, though, is the customer service. The staff is absolutely wonderful to work with and their response time is legendary!!!!! You can't see it from where you're sitting but we're blushing over here. Thank you so much and we'll do our best to keep improving. Cons: Cumbersome to use as a manager. Overall: The product itself has amazing potential for productivity. The issue I ran into with my team was the ease of use. Many team members had difficulty figuring out how to navigate the app. As a manager, it was disappointing to have only a web interface for me to use instead of also being granted mobile access. Overall: The Customer Support is outstanding. The supporting team have been through in their explanation and support to my questions. The tool is a work in progress and the updates been delivered is a reflection of what the users have asked. Recommendations to other buyers: The inability for the employees to update their submitted expenses. The expense must be submitted again so duplicates are created in the process. Managers do not have the tools to erase the duplicated items. Connecteam has helped our business out tremendous. Everything at our fingertips. Pros: The fact that all my staff can access the info anywhere and they can connect with each other at any time. Pros: Being able to keep a better grip on my employees time to avoid unnecessary overtime. I also like being able to get my reports instead of waiting. Glad you're having a positive experience. New reports will be available in the next few weeks! and gives us a fast service. The App was specially customized to our needs and to our organizational structure. Considering of all these above-mentioned features, we absolutely recommend Connecteam. Pros: Free, ability to communicate to employees all at once, easy to download. No complaints from the employees. Glad to hear you liked Connecteam despite it missing a few things you were looking for. Unfortunately, there is no way to confirm an activation link is sentsince it is sent using a text message. Those are sent from the providers and we have no way of knowing if it was received or not. I can tell you that deliverability rates are in the high 90 percentiles. We'll also be introducing a mobile manager app in the very near future. Cons: Each time I'm logging in I need to define the language again and again. Pros: I like the different options I have and the app that my employees can use to be kept updated and be connected. The customer service is wonderful as well. They truly try to help you out when necessary. Thanks for the feedback and welcome onboard! Cons: still lacks some functionality I'm looking for. Overall: It was so easy to start working and create an app. Took me just a couple of minutes and I was set up. They also have templates once you're in the system that help you create content and their customer support team are the best. Comments: Very easy to use, easy instructions. We learned how to use this software in 1 day! Great product and highly recommend it to everyone. Good but still needs improvements. Comments: Started using for employee timekeeping. Came across minor bugs, but customer support was great fixing them quickly. Fast fixes is how we roll...Also, even faster rollouts of new features. Easy to use, free program. Pros: This is a user friendly application. We liked the ease of use. We also liked that it was a free application. It was also an easy, user friendly, set up. We will continue to utilize the program. Cons: We have had issues when used to log in and out of work. The app would lock up frequently causing a need to restart the program. It has not deterred us from using the application, just needs to be fixed. Glad you found Connecteam easy to use and useful. We are constantly updating and improving Connecteam and will continue to do so. Overall: I've been using their service for a little over three months now and to say that it's simple would be a gross understatement. It allows me access from anywhere, I can see where the punches are taking place, and it eliminates the guesswork from payroll. You can't see it from where you're sitting but we're blushing over here. We work hard to make Connecteam easy so we love hearing that. We're also continuously updating the Launch Pad and mobile app with more assets and improvements so staying easy to use is always a challenge and we're glad to hear we're living up to it. Overall: This software has truly been a great help to our company. We love the location feature as well as the Quiz and other features. Pros: Its value for money and allowing even the smallest organization to tackle challenging HR issues with ease. Cons: It would be convenient if the data entered could be graphically interpreted. Also sharing of large content data such as videos and presentations to enhance learning capabilities. thanks for your comments and glad you like using Connecteam. By the way you can upload videos, presentations, and PDFs, using the Skills modules. I had a few issues starting up but now I find the program very helpfull. Support was great. Pros: Being able to pull off time reports when I need instead of waiting for employees to hand them in at the begining of the next week. Cons: Would like to be able to format the reports the way that suits me. Maybe there is a way to do that I just havent figured it out yet. Hey Bob, glad you're finding Connecteam useful. I've taken down a note with regards to your comment on the reports and we will try to work that in as soon as possible. Comments: Connecteam is an intelligent collaboration solution. In Sodastream, we found this solution friendly and useful, with high adoption rates among our users. The Connecteam staff are creative and dynamic, and great partners to work with. Comments: Connecteam has allowed me to take my disorganized fraternity to a high functioning and organized dream. My work time has been cut in half and I don't have to use different applications to gather the info I need from members. Truly power stuff. Easy to use. Just stated and haven't upgraded yet. Pros: Easy, and can communicate a variety of topics to employees like training, performance, event. I love that you can send documents and videos. In general the software looks useful. Pros: The admin internet site is great. Easy to use, self explanatory and looks great. There are any options although some are missing. Cons: The application UI looks old and not updated. It's not as fun as an application should be. and not as easy. Overall: Communicating with the employees that are not computer users. Thanks a lot, Offer. We appreciate your feedback. Comments: Great support, easy to manage and usefully for our company. Overall: Amazing UI and functionality in the ability to track and follow schedules send organization or team specific notifications and reminders and the ability to train your team straight from the app. Cons: Missing too many features. Overall: There are many ways Connecteam can improve drastically. The first way is to allow syncing of calendars or offer its own scheduler. The second is to allow API access. Third, allow staff to be assigned jobs with a value which can then be paid via Stripe. Thanks for your comments, Jon. All your suggestions are in our roadmap and will be added to the platform within 90 days. So let me make you this offer: continue to use Connecteam free of charge for the next month or so and then come back here and change (or don't) your review. What do you say?